Lemax Christmas Parade Marching Band (Set of 8) table accent depicts a uniformed band section of a Christmas Parade marching through the streets to join in the Christmas festivities. Lemax Christmas Parade Marching Band is suitably placed in and amongst a seasonal Lemax village miniature scene. A popular Lemax Caddington Village themed collectable piece which joined the Lemax collection in 2009. 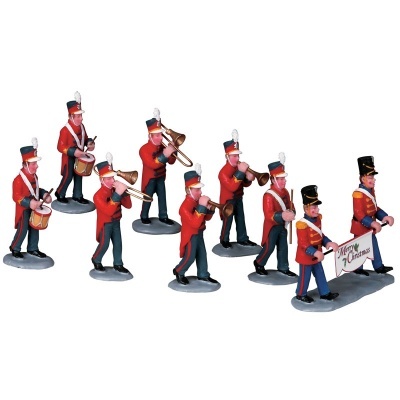 Christmas Parade Marching Band offers a delightful 8-piece self standing hand painted polyresin figurines set on individual street bases to compliment your seasonal Lemax Christmas Village.